What do you do if you have a Digger? 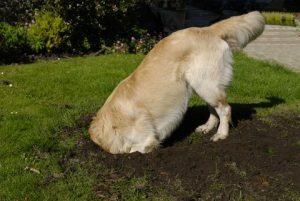 Finding the motivation for your dog’s digging will help tailor the solution to your problem. Expect dogs to provide their own fun if they have not been provided adequate environmental enrichment suited to their breed, age and physical and mental needs. While digging, dogs discover roots of trees, rocks, old bulbs etc. These are all objects that enrich the dog’s intellectual and olfactory environment. Many of these objects ‘play back’. Dog owners generally tire quickly when they play a game of tug with the dog – roots of trees ‘play’ without tiring. Environmental enrichment is providing all pets a stimulating environment to allow them to exercise, choose their preferred environment and to enhance their well being. Introduce other animal scents into your dog’s environment. This can be achieved by taking a rag to a dog owning friend to rub their dog’s scent onto it and leave the rag randomly in the backyard for your pooch to seek out. Playing the radio or soothing music in the background can stimulate your dog. Try natural sounds and animal sounds played back. Who said you had to feed your dog in a bowl? Present your dog’s feed in a variety of ways such as a simple puzzle feeder, hidden throughout the back yard, scattered around the back yard, or buried in an appropriate and approved location. To get the food, your dog must use their natural foraging behaviours and/or mentally solve the puzzle. 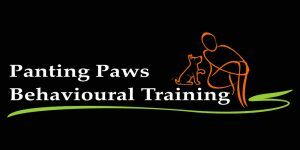 Various items placed in your backyard allowing your dog to investigate and explore naturally. These items could be water or sand pits, durable balls, chew toys etc. Dogs often dig just because they are curious. Dogs that are very social, curious or active may just be exploring their environment when they dig. For you to effectively manage this type of situation, you will need to work out WHY your dog is trying to escape so you can implement the appropriate management tools and training aids to help. Are some breeds likely to be diggers? Many dogs dig because they were bred to dig. Fox and rat terriers, such as Jack Russell Terriers, were developed to track, chase and kill earth-dwelling animals. For these dogs, consider taking up earthdog trials.